Chief Tony Hunt is hereditary chief of the KwaGulth people and is one of the greatest living native artists of the Pacific Northwest. He is fluent in his native Kwak’wala language, which was taught to him by his grandfather, legendary artist Chief Mungo Martin. Chief Hunt created Thunderbird Park with his father, Chief Henry Hunt, and his grandfather. Chief Tony Hunt also designed the Hunt Family Big House in the Royal B.C. Museum, which is a showpiece for the world and a place of pride for his people. His grand masterpiece is the KwaGulth ceremonial Big House at Fort Rupert – the largest traditional native structure ever built in the Pacific Northwest. Chief Hunt has designed nearly 100 full-scale totem poles – more than any First Nation artist. Many of his works are celebrated monuments in countries around the world. Victoria’s sister cities Morioka, Japan and Souchow, China, both have poles carved by him as gifts from the people of Victoria. He also has works of art in international museums and in the Canadian Embassies in Mexico City and Bonn. 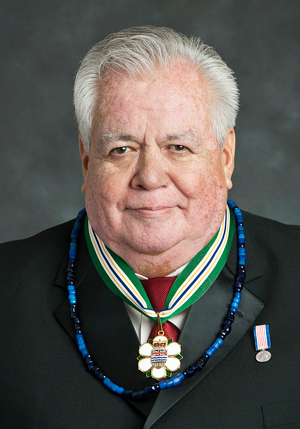 Among the many honours awarded to Chief Hunt outside his traditional culture are an Honorary Doctorate of Law from Royal Roads University and Citation of Merit from the Royal Canadian Academy of Arts.